The u-shape setting diamond ring is a more modern interpretation of the traditional prong setting. Future brides can find simple and elaborate rings with this type of setting. Learn more about the u-shape setting diamond ring to find out if it is right for you. The u-shape setting for diamond rings is a variation of the traditional four prong setting. The base of the ring band forms a u and four prongs support the gemstone, which suspends in air above the u, giving it the security of the prongs without a bulky basket. The u shape forms elegant curves as a design element in this type of setting, adding to the general beauty of the ring rather than simply holding the stone in place. U-shaped settings work well for showing off larger stones because of the free form of the open u shape. 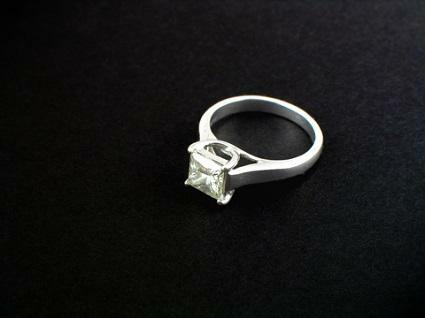 Many ring cuts look beautiful with this type of setting. However, some cuts are more commonly used with the u-shape setting than others such as the emerald, asscher, princess and brilliant cuts. Platinumsmith: Australian jewelry designer Phillip Schmidt creates beautiful artistic rings with a u-shape setting. Schmidt works primarily in platinum and uses diamond and other gemstones. His rings look like a mixture of modern and antique inspired. Chisholm Hunter: The British Chisholm Hunter Diamond Merchants site has a beautiful emerald cut diamond with a gold u-shaped setting that is an example of a simple and elegant ring. Krikawa: American Jewelry designer Lisa Krikawa has a number of unique engagement rings, some with a u-shape setting in many artistic designs that use a variety of metals and accent stones. White Flash: The White Flash site sells five stone u-shaped prong setting diamond rings. The Skye Five Stone diamond ring features the u-shaped setting. Mervis Diamond: Mervis Diamond Importers has a number of styles that include the u-shape setting, including a stunning three-stone diamond ring. Is the U-Shape Diamond Right for You? Selecting your diamond engagement ring can be as simple as falling in love with a certain ring at first sight or it may involve carefully shopping for a certain ring style. The u-shape is a good choice for a larger center stone or multiple stone ring. It lends updates the classic prong setting and shows off the diamond with less metal surrounding the stone than many other modern settings. The prongs are also less likely to snag on clothing than traditional prong settings. If you generally like the look of the u-shape, shop around and see if one of these rings appeals to you. Whether you tirelessly search every jewelry store in town or find the right ring on the first shopping trip, you will recognize the perfect ring.